You can’t quite put your finger on what’s wrong. You’re feeling out of control. You had a grasp on things, but now you don’t. Don’t worry—you likely don’t have a culture problem or a training problem. You just got bigger. Something has fundamentally changed, and now you have different strengths and different needs. We’ve often found ourselves in this position at Atomic because we’ve never explicitly looked to grow. It’s been a side effect of doing good work and being a great place to work. So from our founding to our current size (65 employees in 2 offices), we’ve grown steadily and organically. 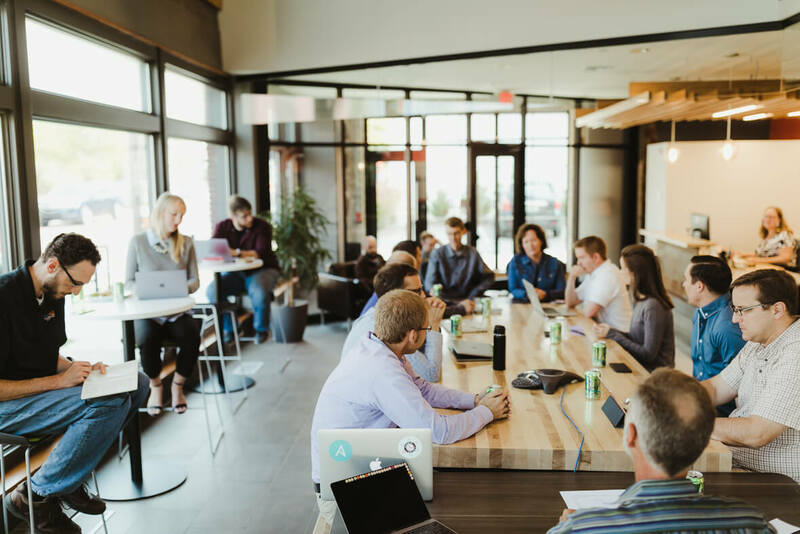 And as we’ve grown, we’ve noticed a few key points along the way—each triggered by a new plateau in headcount—that required us to change the way we operate. The changes certainly weren’t all easy, but they were necessary and in the end positive enhancements. They also led to growth opportunities for various team members. I suspect that growing organizations whose revenue is linearly tied to headcount will see similar organizational inflection points. We’ve worked through six of these phases at Atomic. Each began with an inflection point that we tied to an approximate headcount. Companies, commonly, start as a collection of friends who are interested in working together. Since the team is small, there isn’t need for a lot of structure, rules, or even organization. Communication is easy. Long hours and sacrifice are required by the founder and key team members to make sure the organization is properly setup, secures clients, and successfully delivers the initial projects. The beginning is a stressful but exciting phase. Everyone is working closely together, and the founder is playing a key role in both the sale and delivery of work. In my opinion, companies become “real” when they have 10+ employees. Crossing this milestone means that it’s no longer possible for everyone to work closely with the founder. Most of the founder’s effort has shifted out of delivery and into sales and marketing. This shift from working directly with the team to primarily interfacing with clients requires a clear written set of expectations for the company. At Atomic, this is when we introduced our initial set of rules and expectations. Our point of view was to expect high performance and keep our rule set as small as possible to enable smart people to make choices. This is also the time that we formalized our core set of value mantras. The mantras were developed by observing the current characteristics that we liked about the company. We wrote them down so that we could continue to live those values as we grew. We continue to use our value mantras daily in our formal recognition program, when we hire, and when we need to fire. When the company grows over 20 people, it’s no longer possible for the founder to manage all of the operations. The founder has become the bottleneck to growth. In order to break through this roadblock and save the founder’s sanity, help is needed. At Atomic we added more capacity to help address the problem by replicating the founders model (selling, managing clients, managing teams, etc) with two more team members, myself and Shawn Crowley. Instead of dividing the major components of the work, the three-person team shared the load for each component. Adding two people to this work at the same time wasn’t efficient, but in hindsight, it was a very robust plan. It protected the company from one of us deciding to leave. We copied this pattern when we opened our Ann Arbor office. When the company reaches 30 people, it becomes impossible for everybody to have deep relationships with everyone. This is a challenge for any company, especially one that has long project cycle times and a culture of social connection. In order to combat this challenge, we implemented our pair lunch program, our internal office newsletter (the Nucleus), and a more structured and inclusive approach to hiring. At 50 people, project consistency becomes a challenge. When the team is smaller, you can lean on the individual skills of team members to deliver high-quality solutions. As you grow, project-to-project delivery techniques begin to drift. When Atomic was about this size, I had lunch with a key client that we were building two different platforms for. Each platform was being developed by a separate team. During the lunch, the client informed me that he was happy with both teams, but the process and project management was different in both situations. This difference required our client to modify his approach during the oversight of each project so that he could take advantage of the unique skills on both teams. Project situations are unique, but we need to ensure that all projects are being run and managed in an Atomic Way. It shouldn’t be expected that our client needed to modify his approach. We owe it to our clients to provide both high quality and incredible customer experience. In order to help facilitate this challenge we developed the Senior Strategist job, and Micah Alles stepped into the position. Micah is responsible for meeting with every team in the organization every few weeks. He works diligently to ensure that best practices are spread, helps to identify and build appropriate project management tooling, identifies when help is needed, and shares general project wisdom. Shortly after rolling out the Senior Strategist job, we also created the Delivery Lead job. The combination of the Senior Strategist and Delivery Lead has greatly improved our delivery consistency. At 60 people, a small people management team is able to support people during emergencies, but it’s impossible to give individuals the attention or focus that they deserve. This is a frustrating situation because individuals aren’t getting the coaching they need, and managers are left feeling guilty because they simply don’t have the time to help. Recently, instead of hiring an HR professional, we opted to create a new role for experienced Atoms. The title for the role is Career Development Manager (CDM). CDMs are responsible for the career development of a handful of other Atoms. They play the employee support role in our management matrix. CDMs have helped address both of our above concerns. Being a CDM has also been an excellent growth opportunity for the Atoms that stepped into the role. The system is scalable, and we’re excited about its long-term potential. We’re not perfect, and we still have a lot to learn. We are, however, constantly innovating. We’ve already started identifying ways to mitigate the effects of organizational inflection points that we see on the horizon. We’re excited about the future and the opportunities that it presents for our team. Please feel free to share your inflection point experiences in the comments. I absolutely love your commitment and focus on humans and how it ties into every strategy of your company. I especially appreciate that you’re not afraid to be transparent with firing. Many companies can’t say anything good about letting people go, and their decisions are often a black eye that they feel the need to cover up. I grew up in Grand Rapids, and if I hadn’t later established a life outside of Michigan, I would be knocking on your door today to see what kind of opportunity I could have with you. Keep up the great work, and I look forward to your future posts! Thanks for the nice comment, Chris. I’m glad you enjoyed the post. This reads like a roadmap. I could picture every step in the process (journey), how things change as you move forward and the adjustments that are needed to continue. I’ve always been inspired by AO – both the work and the people. Cheers!